When viewed from above, much of the landscape of South Carolina is clearly covered in mysterious oval depressions that aren’t obvious from ground level. Known as “Carolina Bays”, nobody really knows how these unique geological features were formed. Despite their name, Carolina Bays can also be found in Delaware, Maryland, New Jersey, North Carolina, Virginia, Georgia, and northcentral Florida. They vary in size from one to several thousand acres, and are often gathered in groups. Many are filled with water and named as lakes, but most contain vegetated wetland. Most striking however, is that every single one is invariably aligned in almost exactly same direction – which has led some people to claim that they might be the result of a meteor impact. It would have to have been a pretty serious impact, as there are estimated to be over 500,000 of them. This is Lake Waccamaw, north Carolina, which is widely considered the largest Carolina bay. George Howard (a bit of a Carolina Bay fanatic), has created an exhaustive KML file that marks the location of many thousands of the bays in North Carolina. 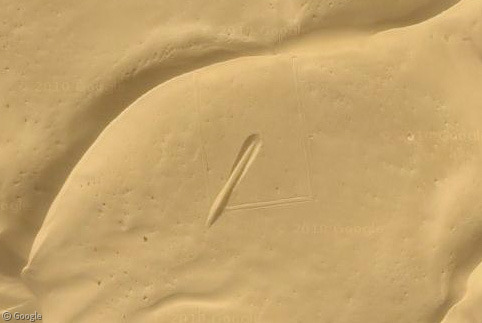 This image was taken in Google Earth, and shows the white outlines that have been used to mark the locations. So, who here can solve the mystery of the Carolina Bays? You can read more about Carolina Bays at Wikipedia. Thanks to Keith Wright, david and Ogle Earth. I’m neither a physicist or a geologist, but I seem to recall reading somewhere that meteor craters are always circular, regardless of the angle of impact. Or perhaps it was on the TV – I have in mind a demonstration involving a tray of flour and a few steel ball bearings! if you drop the bearings from above into the flour they would leave a circular pattern. I would think that if you throw the bearins at an angle then the result would be a higher rim closest to the direction you threw and the material the bearing moved would be dispersed in a direction away from you. if that ^^ is the case then I would definitely agree with the meteor theory. If a large meteor crashed into earth where the atlantic is now, then the material would be dispersed out at angles from the impact point. the secondary impact points from the earth material or fragments could have created the bays. This would support theories I have heard concerning a once connected land mass. If the americas and the europe and africa were once connected and a very large meteor crashed into that land mass it could have broken the landmass apart thus creating the Atlantic and bays along the Eastern US. On a semi-related note, check out how many piers there are on Lake Waccamaw! The ovals in the craters idea is right. I saw the same show on Discovery, and it was sand. A reason the circes as craters idea took hold was that originally that folks assumed a metoror’s transition to being a metorite would/could happen at any angle of incidence (the angle from the horizon). On earth, a meteor has to come in at a specifc angluar range in order to make it ot the surface, based on it’s makeup and weght (mass). A lower angle and there is too much atmosphere to go through, and many also skip away back into space. I’ll guess (with zero Google Search time, mind you) that a more logical explanation would be one that talks about slow geologic processes as the plates moved away from the montain ranges as much of the SE US was created. Much of it was underwater, so I’m sure there is a theory (or even GASP! proof) that talks about rapid changed in elevation as well as their slow march toward the sea as the sources of the molten goo remained (relatively) stationary. Think Hawaiian Islands, hotspots, etc. Just my first draft, out of the gate, and with nothing to substantiate it! The explanation I read theorized that they were not direct impact sites from meteors, rather they were secondary impact sites from ejecta from a major strike. Draw lines through the long axis of the ovals, and they seem to converge on a central point of origination. Mysterious indeed! I’m no geologist, but these “bays” look very much like chevrons on the southern coast of Madagascar that are widely beleived to have been caused by the backflow from a huge tsunami. This tsunami happened many thousands of years ago. It was created by a mega earthquake in the middle of the Indian Ocean. It also left similar chevrons on the southeast coast of Australia. [email protected]&Tim, the two finest answers I’ve seen in a long time. Actually, after reading the posts, and looking at the area, I have another theory, almost all of the areas point generally NE, to SW, I think that during the ice age, a glacier would not recede continuously, but rather in would essentially push and pull, and the lakes are a result of the earth, and rock moved, each time the glacier was pushed. If you will note, almost all of the larger “bays, are grouped in nearly the same line, pointing NE, so the glacier probably receded to the NW. Basically, these are, if I remember the term right, “morain piles. which is the piles of dirt that a progressing glacier leaves behind. The larger bays were created during a short cold spell at the end of the Ice Age. The largest morian pile for this particular Glacier, if you could imagine, therefore would be Florida. Farmerjoe, as far as i know this area of the earth was never glaciated. Seems to me that if we consider the Carolina Bays along with the similar structures in Perth, their major axes would converge in the ocean south of Alaska. They do not seem to be “pointing” to the same origin as the ones in the US or Australia…more mystery! Is was thinking the same thing as farmerjoe but didnt know how to say it without looking stupid (a chorus of ‘Doesnt usually stop you!’ rings out). To me it looks like very big things have been dragged by a very powerful thing. Either that or they are the paw prints of huge, ancient, comedy cartoon dogs. Try this one for size: the hypothesis is that the Chixulub crater splashed outwards as shown in this geological map of the US, possibly accompanied by other detritus arriving from space at the same time. This is the clearest and most obvious answer. Next mystery, please. The massive crater from Chixulub’s in the sea off the west side of the Yucatan peninsula, see the rest of the geological website. However, the argument’s that that was just the big chunk, the other sites may well have been backsplash from the buckshot caused the first big collision in the asteroid belt. I live right amongst most of those images and it just seems obvious to me how this happens. Over my lifetime, I’ve watched some of these “bays” actually form. If you study the aerial photography over the course of a decade, you can see that they’re CAUSED BY RIVERS. A river constantly moves, eroding away its banks and changing its path. They short-circuit themselves often, leaving loops of relatively stagnant water. The loops usually settle over the years as the center erodes into the deeper water, forming a pond with a well defined, very uniform edge. The ponds eventually fill and grow over with new wetland life. From that point, all I can offer is conjecture, but I’d imagine that it takes hundreds of years for larger plants and trees to grow in these voids. After so much time, the climate and the predominant species of plants has changed and, so, you get a near-perfect circle of contrasting species of plants thriving in the newest and best topsoil around. As a West Australian I have to point out that the ovoid lakes highlighted in the links above are actually salt pans following the course of an incredibly ancient river system – dating from when Australia was still connected to Antarctica. You can actually follow it (and other similar formations) for hundreds of miles across the landscape. I suspect the oval shape has more to do with water pooling between slight, parallel ridges on a mostly flat landscape than any impact event. I guess any impacts could have fortuitously landed right on the course of the river bed, but it seems to be stretching things a bit. That ignores any explanation for why they are all oriented in the same direction…over very wide areas! I’m not convinced a meandering river would be so orderly. They are geological formations not unidentified stationary mysteries. Try following the history of plate tectonics in that region and you will see how the formations occurred. Shoemaker-Levy Nine proved a cometary mass can desetigrate creating a bombardment of gargantuate proportions. I’m sure those impacts seen from the earth were the larger ones and thousands or even millions of smaller fragments collided but could not be seen. The age of the Bays suggest the area was under a shallow sea at times. Fragmentary impact into water and at an angle could account for the Bays. If the fragments were cometary in origin,then it is highly possible they were ice and carried fewer traces of irriduim that an iron meteorite would. Of course the ice would have vaporized upon impact leaving no traces. It would also account for the overlapping of the Bays,one atop the other as they frequently appear. This would be true for a “stream” of debris traveling along in a line,impacting at differnt intervals. The best test of my theory would be to simply toss various sized stones into a semi-dry mud puddle then observe the markings when it dried. This type of disaster would also leave a distinct carbon layer from decaying vegitation much like that that was found at Tunguska.This is my theory. The angle of the oval shape indicates that whatever made these shapes came from north-north west direction, and angled inclination impact. There are NO perfectly circular bays that would mimic a meteor impact from directly above. These are impact craters caused by massive, speeding chunks of ice. Specifically, ejecta (large chunks of ice) from a glacial ice sheet in the northern hemisphere, that was hit with either a meteor or more likely, a comet….most likely, the Laurentide ice sheet. The Laurentide ice sheet was massive, over a mile thick in some places. The great lakes are a remnant of these massive repositories of water and earth-scouring power. If a comet hit this massive ice sheet at a slight angle, the pressure wave would have blasted a huge amount of the sheet outward. Some would have been vaporized into steam, other parts pulverized. But yet, ice is more friable than bedrock, and it is reasonable to assume that large, and even mountain-sized chunks were ejected along with smaller sized pieces. These chunks rapidly flew across the ancient sky, toward what today is the Carolinas, and they landed in approximately and relatively the same place at the same time. Do an experiment on a frozen pond. Fire a bullet at an angle into the ice. Watch the dispersal pattern of the ice fragments into the surrounding snow. They have similar patterns as carolina bays. Furthermore, there may be NO evidence of the crater itself, although future space based sensors may discover it. An impact of a comet into mile-thick ice would be relatively instantly erased, both by the flooding of the impact site with new snow and water, and the fact that the majority of the impact was absorbed by the massive ice sheet, which has melted away along with the crater. Simply, Carolina bays are the splashes of ice from a massive impact event on the glacial ice sheet. Don’t think Zebras. There’s no impact event, glacial or bare earth, it didn’t cause the Younger Dryus, there is no addition to the rims, when they intersect they build off the same base. These exist where persistant winds meet large volumes of alluvium, usually old or migrating river beds. I notice no mention of the proceedings from October 2009 that failed to find any support for Firestone et.al.